Sofia airport is the main airport of Bulgaria. From there, to reach Sofia University "St. Kliment Ohridski" (The Rectorat), which is located in the central part of Sofia, you may take city bus No. 84 from Terminals 1 [map] and 2 [map]. The price of the bus ticket is 1 Lev. The stop of the bus is located against the Sofia University [map], just across the street. 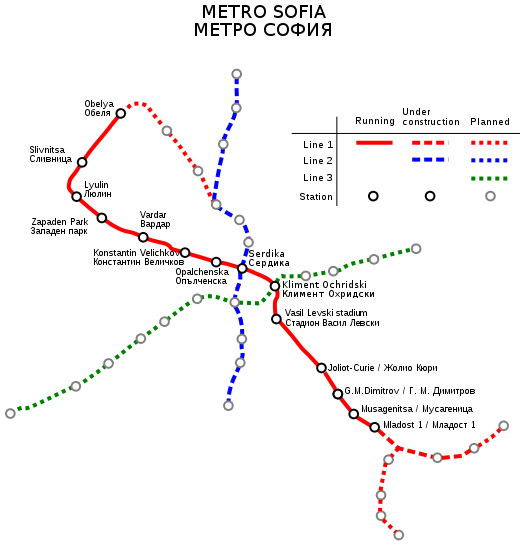 To cross the street – use the underground passage of the subway, called Metropolitan (or briefly "Metro") [map]. The Bulgarian currency is Lev, abbreviated "BGN" ("the new Lev") ("Lev" means "lion" in Bulgarian. The plural, Levs, is pronounced "Leva" in Bulgarian). The exchange rate is 1 EUR = 1.95583 BGN. This exchange rate has been fixed (it does not vary) since 1 January 1999. A taxi may cost up to 12 Levs (about 6 Euros) from the Sofia Airport (Terminals 1 [map] and 2 [map]) to Sofia University "St. Kliment Ohridski" (Rectorat) [map]. If your hotel is located in the central part of Sofia, the price will be approximately the same. Warning: In Sofia there can be traffic jams morning 8:00–11:00 and late afternoon 16:00–19:00. Have this in mind when you plan your trip back to the airport. Daytime rate (6:00 a.m.-10:00 p.m.): 0.59 BGN per km. Nighttime rate (6:00 a.m.-10:00 p.m.): 0.70 BGN per km. Wait rate - 0.18 BGN per min. WARNING: Do not use the services of occasional taxi drivers offering to bring you to Sofia. They might be cheaters, who will charge you several times the normal price! In the arrival's hall of the Sofia Airport, you will see counters of the taxi companies, where you can order your taxi. The taxi driver will immediately come to accompany you to the car. From the Sofia Central Railway Station [map] and the Central Bus Station [map] you can easier reach Sofia University "St. Kliment Ohridski" (The Rectorat) [map] or your hotel by taxi. The central building of Sofia University "St. Kliment Ohridski" (The Rectorat) [map] is located at the crossings of two of the main streets in Sofia: "Tsar Osvoboditel" Blvd. (East–West) and "Vasil Levski" Blvd. (North–South). In Bulgarian Sofia University "St. Kliment Ohridski" (The Rectorat) is pronounced Sofiyski Universitet "Sveti Kliment Ohridski" (Rektorat). There is a stop of the Metropolitan [map] just in front of Sofia University "St. Kliment Ohridski" [map]. The stop is named after the university. If your hotel is located near a stop of the Metropolitan, the latter provides be the most convenient transport to Sofia University, because it is not affected by traffic jams. The price of the Metropolitan ticket is 1 Lev. Note that this ticket is different from the bus/tram tickets and it can be purchased at the Metropolitan stations. See the map below!